COLUMBIA, Mo. 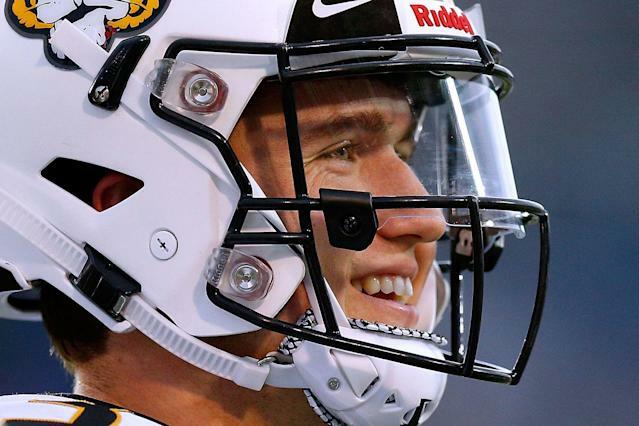 — The son of a former Missouri Tiger, Drew Lock grew up wanting to wear the black and gold, so much so that when he developed into a four-star prep quarterback at Lee’s Summit High, he spurned the likes of blue-bloods like Ohio State and Texas to attend his home-state school in 2015. Little did Lock know that he would be thrown into the fire for the biggest challenge of his young life as a true 18-year-old freshman. It played a significant role in helping Drew earn the type of respect from his college teammates that has NFL teams intrigued heading into the 2019 NFL draft. “Physically, he has a lot to like ... an impressive combination of size, underrated mobility and a live arm,” one NFL evaluator told Yahoo Sports. Andy’s son wasn’t supposed to have his grit tested so early. Drew was initially expected to backup Maty Mauk, one of nine returning offensive starters from a team that was coming off back-to-back appearances in the SEC championship game. And things started well enough, as Mauk led the Tigers to a 3-1 start in the 2015 season. But when Mauk was suspended indefinitely before the Tigers’ fifth game of the season, the Tigers entrusted the quarterback position to Lock, who won his first start but promptly lost his next four in the heart of the Tigers’ SEC slate. Lock struggled during that stretch, completing only 41 percent of his passes to go with four interceptions and zero touchdowns. And while the guilt of his struggles was personally devastating, things in Columbia got more complicated when several football players threatened to boycott all football-related activities until the school’s president resigned. Many of the team’s African-American players joined an ongoing campus protest of the school administration’s handling of several racial issues on campus. This brought national attention to the cause, and eventually led to the president resigning. It came at a cost as the threatened boycott angered some fans. “[The situation] sucked,” senior guard Kevin Pendleton said. “We were losing games and the protests happened ... so our fan base, it kind of shredded. So we weren’t getting the same support and we were losing, so it was just the perfect storm of bad stuff. As the team’s starting quarterback, Lock, who was only a few months out of high school, had to face the media after the losses and navigate the politics of a struggling team in the midst of a swirling controversy. Handle it wrong, and Lock could have lost the locker room. “Drew handled it like a boss,” senior receiver Cam Hilton said. “Drew handles everything like a boss. Lock immediately let his teammates know he supported their cause, and that he stood with them. Andy remembers watching all of this happen over the six-week period — the losing, the furor over the protests — and wanting to advise his son on how to handle it all. He was amazed at how little help Drew needed. Shortly after a few of his teammates announced their boycott, the entire team posed together for a picture showing unity for the cause. Drew was in that photo, and he insists he was ready to join his teammates if they wanted to go through with sitting out the game against BYU. The boycott never happened as the university had a change in senior leadership. 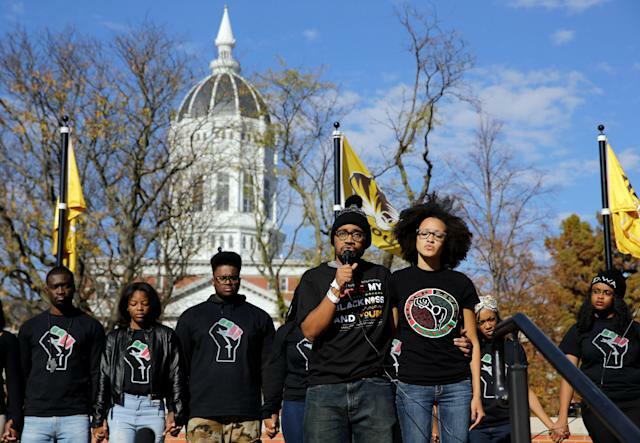 Since then, the school has reaffirmed its commitment to diversity, and faculty diversity has increased but only slightly, according to the Columbia Missourian, the city’s daily newspaper managed by the Missouri School of Journalism. With the added element of their longtime coach’s sudden decision to retire — Gary Pinkel announced he would leave at the end of the season due to lymphoma — Drew knew the Tigers badly needed a program-unifying win against BYU, which he helped deliver by completing 19 of 28 passes for 244 yards and a touchdown in a 20-16 victory. The Tigers finished that season 5-7. The next year, Lock was named a team captain for the first of three consecutive years. Since then, the 6-foot-4, 228-pound senior has blossomed into a likely first-round NFL draft pick, throwing 95 touchdowns to 31 interceptions as one of the unquestioned leaders of a team that has posted winning seasons and bowl appearances the past two years. NFL teams often ask Lock about how he handled that difficult 2015 season, and how he used it to earn his teammates’ respect. Where will Lock land in NFL draft? NFL Network analyst Daniel Jeremiah, who attended Lock’s pro day, says the fact that Lock is a battle-tested, multiyear starter might make for an interesting contrast to the two other top quarterbacks in this draft, Oklahoma’s Kyler Murray and Ohio State’s Dwayne Haskins. Jeremiah said slotting Lock, Haskins and Murray will come down to talent, with intangibles — like Lock’s experience — likely serving as a tiebreaker of sorts. At the moment, Jeremiah sees Murray going No. 1 overall to Arizona with Lock and Haskins falling somewhere in the top 15. Lock has met with or will formally meet with Denver, Washington, Miami and Jacksonville, a source told Yahoo Sports. Given the rave reviews his teammates have bestowed upon his personality, Lock likely didn’t or won’t have problems with those teams. And with his four-year collegiate journey complete, Lock can appreciate how his rocky true freshman year in 2015 helped shape his tenure and perception at Missouri.